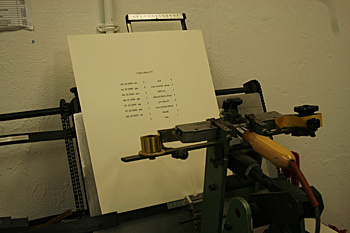 All words were removed from five iconic speeches by converting with the MIDI programme to instrumental sounds. 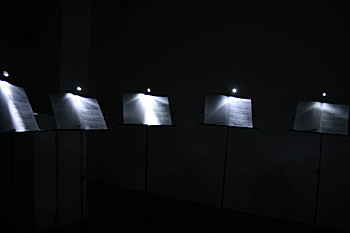 The instruments were chosen from my impression of each speaker's character, the narratives and the quality of the voice. As a result, the audio sounds from the historical speeches represent the nonverbal expressions which lie behind the words. Music scores were also created from these sounds. 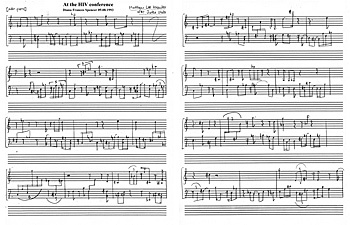 A music score is not only musical notation, it is also a form of language which in 'Historical Speech' also helped to show visually the nonverbal expression inherent in the utterance. Otake converted Princess Diana's speech to MIDI sound/score, removed the all words from the speech. 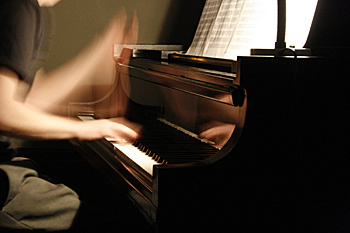 Matthew recomposed the music, performing the new version live. The sentences were printed in black ink and the letter '1' embossed in gold. In this practice, I am examining how sentences show a range of interpretations. 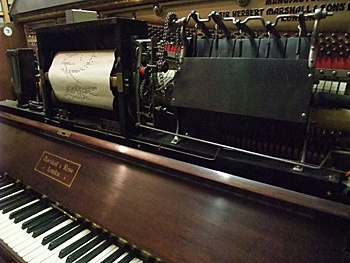 Translations of images into sounds using piano roll which was punched according to the image of the painting and then played with a self-playing piano: a Pianola.